Flight booking with Gokyo Treks and Expedition makes your journey more reliable. Book airline tickets over the online for the international and domestic destination in Nepal. Nepal is the world popular nation for the travel industry. We give you modest worldwide flight tickets for national transporter and global carriers where you can even appreciate most ideal limits too. It’s solitary a matter of few ticks that meeting any piece of the world is conceivable. As you come with us, you will get cheap tickets deal on american airlines, southwest airlines, priceline flights, hotwire flights…etc. Just search with how to find cheap flights or airline tickets best price or flight booking sites. We are additionally outfitted with a scope of flexible installment alternatives alongside a 24 Hrs Support for any Ticketing Related Issues. To provide good service and to consume the time of our guest, the Nepal government has been considered. There are many airports located in Nepal in several locations such as Pokhara, Surkhet, Bharatpur, Jomsom, Biratnagar, Nepaljung Janakpur etc. Lukla is located on the lap of big rock, has a small airstrip and settled on 2,800 above sea level. Lukla is a gateway to discover Everest region trek. These days Lukla is popular as trekking junction with many lodging options, shops, and trekking luggage to buy or rent. Lukla is the gateway for heli everest that leads to the highest mount everest. Airfare is changing according to the monthly season, so email us with details of your travel date to get special deal. Flight from Kathmandu to Pokhara or pokhara mountain flight gives you an opportunity to the breathtaking views of Annapurna and Langtang Himalayan ranges. Flying to pokhara, you might cross the langtang landscapes and snow-capped mountains and green Mahabharat range to the south is adventurous. Check out the buddha air flight schedule or yeti airlines – airfare is changing according to the monthly season. Email us either for pokhara to kathmandu flight with Buddha air details of your travel date to get special deal. If you think that you are not able to trek from Pokhara to Jomsom, don’t worry there are several airlines that provide you service to fly from Pokhara to Jomsom every morning. It takes 20 min to reach Jomsom from Pokhara. From Pokhara to Jomsom flight is easy and is not risky too. Check and book yeti air ticket price because the airfare is changing. If you have not enough time to visit Chitwan but you want to enjoy and experience the adventurous Jungle safari in Chitwan national park then we can offer you the cheapest and shortest Bharatpur flight. It takes just 25 min to reach Bharatpur from international Airport Kathmandu. Buddha Air and Yeti airline operate daily on two flights. The flight is not too busy because road transportation is available. Airfare is changing according to the monthly season, so email us with details of your travel date to get special deal. Bhairawa is the entrance point of Lumbini, the pilgrimage shrines of Buddhist where Gautama Buddha (Siddhartha Gautama) was born. If you have deficient time to visit Lumbini then Buddha Air and Yeti Air operate daily flight from Kathmandu to Bhairawa Airport is officially recognized as Gautama Buddha Airport. It takes about 35 min from international Airport Kathmandu to reach Bhairawa. Airfare is changing according to the monthly season, so email us with details of your travel date to get special deal. Nepalgunj is the transport core western region of Nepal, lied in Banke district, close to the southern border with India which is just 8 km south from Nepalgunj. From Kathmandu, we can reach there within one hour which is almost 520 Km. Buddha Air and Yeti Air are the standard airlines operating a flight to Nepalgunj. Airfare is changing according to the monthly season, so email us with details of your travel date to get special deal. Biratnagar city is the second biggest city in Nepal, mainly recognized as the industrial core of the country, lies in the Morang district. Biratnagar attracts many tourists with its colorful festivals and unique culture. Flying to Biratnagar takes about 50 minutes from Kathmandu city which is 290 Km in distance. The flight is operated regularly by Yeti air and Buddha Air. Biratnagar is a gateway to discover the Koshi Tappu Wildlife reserve which offers to enjoy the bird’s life, and also it shorter the way to get Ialm Tea state. The fascinating view of Mt. Makalu and Mt. Kanchenjunga makes your flight journey awesome. Airfare is changing according to the monthly season, so email us with details of your travel date to get special deal. Flight to Tumlingtar is the best option to trek around Makalu region which is absolutely wonderful and still a virgin area to the northwest corner of the Sankhuwasabha district. Makalu region is surrounded by very beautiful views such as west side is bordered by Mt. Everest, North is Tibet, Arun River at East and Sabha River at the south. Also in the early 90s the region is devoted to national park and conservation. Airfare is changing according to the monthly season, so email us with details of your travel date to get special deal. Phaplu Airport is an optional choice for Everest base camp trekking and second Busy Airport in Solukhumbu district. It can be an also optional choice to trek Makalu region through Arun valley trails. The Airport is very famous as Phaplu Airport because it located in Phaplu town in Solukhumbu district. The Airport resides at an altitude of 7918 meters above mean sea level. It takes 25 min to reach Phaplu airport from Kathmandu International Airport. Airfare is changing according to the monthly season, so email us with details of your travel date to get special deal. 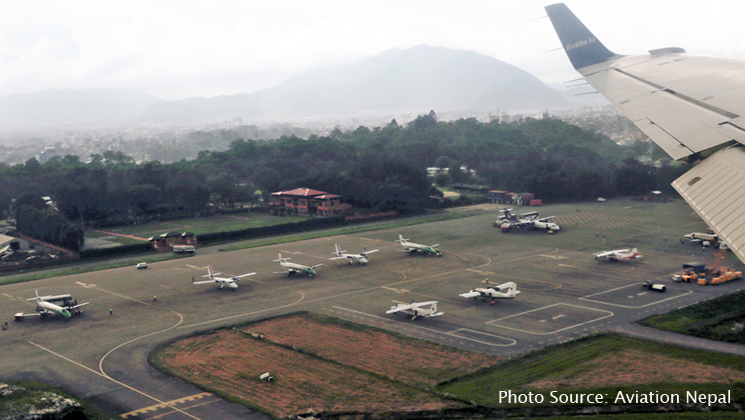 Lamidanda Airport lies in Khotang district at an altitude of 4,100 feet above mean sea level. Nepal Airline, Buddha Air and Tara Air operate the flight to this airport. Airfare is changing according to the monthly season, so email us to get good deal.